This past weekend, thousands of mourners lined the streets of Charlotte, North Carolina, as the body of famed evangelist Billy Graham was moved to his childhood home. Graham’s body was transported through many of his most traveled streets, finally coming to a stop at the Billy Graham Library, the grounds of which contain his childhood home. “My father Billy Graham made me promise long ago that we would take him back to Charlotte after he died, and that’s what we’re in the process of doing right now. The outpouring of love we are seeing as we travel from Asheville to Charlotte via the motorcade with him is overwhelming,” the reverend’s son, Franklin Graham, wrote in a Facebook post Saturday. Franklin went on to explain the significance of the cross-shaped entrance to the library. The heartfelt post included several telling photos depicting just how loved the late Rev. Graham was by his Charlotte community. 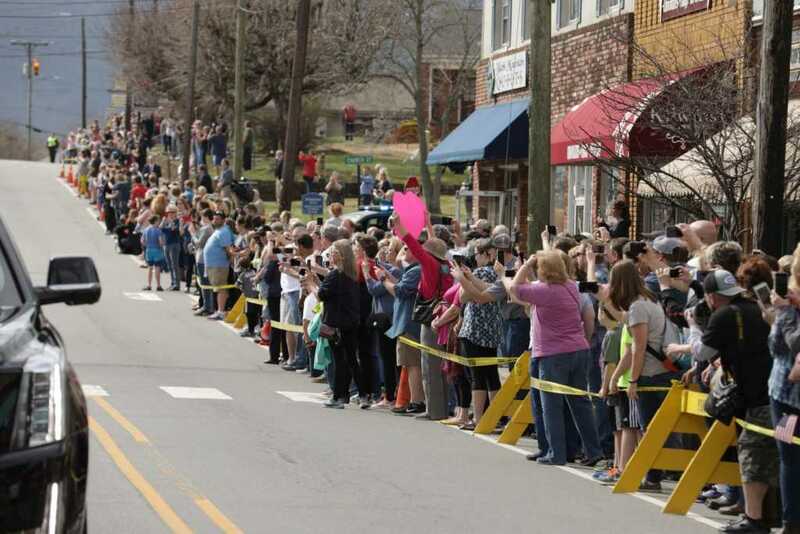 “I want to thank each and every one of the thousands who came out today to pay their respects to my father Billy Graham along the motorcade route from Asheville to Charlotte, NC. Words can’t express how our family was moved—it is something we will never forget,” Franklin wrote in a separate post. “My father would have been in disbelief. Our gratitude to all of the fire departments and local police departments who came out, and special appreciation to the North Carolina State Highway Patrol who did such an incredible job making this possible,” he added. Billy’s daughter, Anne Graham Lotz, paid tribute to her late father and issued a call for more to come to Christ following his passing. “Because Daddy’s message is God’s message. And it’s a message of genuine hope for the future, of love for the present, of forgiveness for the past,” she added. Rev. Graham’s funeral is due to be held at the Billy Graham Library at noon this Friday, March 2, and will be attended by more than 2,000 people, including President Donald Trump. All other living presidents are set to pay their respects, although a spokesperson for the Bush family said that former President George W. Bush and his wife Laura will be unable to make the ceremony due to a previous commitment, and will, therefore, come to Charlotte on Monday to pay their respects. Flowers have been laid in tribute to the great evangelist outside the library where his body is currently laid. Credit: Twitter. On Sunday, the Billy Graham Evangelistic Association released a video of the evangelist’s grandson, preacher Will Graham, giving a powerful overview of the late minister’s message of hope to the nations. “My grandfather preached all these years so that you could know that you can have your sins forgiven.” Will Graham says in the video. “I want you to know that you too can know Jesus Christ.